HNSKY (Hallo Northern Sky Planetarium) is a free planetarium program for Windows which lets you study and know about different celestial bodies. The huge collection of HNKSY program includes 30000 deepsky objects, all stars to magnitude 12, planets, Moon, Sun, asteroids, comets, and much more. The freeware also boasts of having original GSC CD’s, GSC ACT or the USNO UCAC4 to magnitude 16. As for looking for any of the celestial bodies, you can search for them using their name, coordinates, or directions. The freeware also offers lots of customization options using which you can choose how you want to see any object and other things. Get the HNSKY freeware using the link given at the end of this review and launch it. On launching the freeware, you will see the interface as shown in the screenshot below. You can see the globe’s digital wireframe like view in the center. The main tools and options for using this free planetarium program for Windows are at top: File, Search, IN, OUT, RESET, Screen, Objects, and Date. The File option provides you with commonly found options like Load, Save, Open Asteroid Data Editor, Comet Data Editor, etc.. The other three options IN, OUT, RESET are for zooming in, zooming out, and resetting the position of the object. The Search option provides you with options which help you in locating and focusing on any particular celestial body. 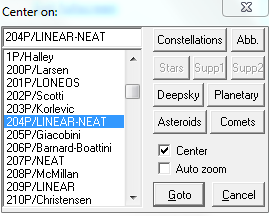 You can either choose to enter the name or simply click on the corresponding button (Constellation, Comets, Asteroids, etc..) to get the list of all bodies related to it. 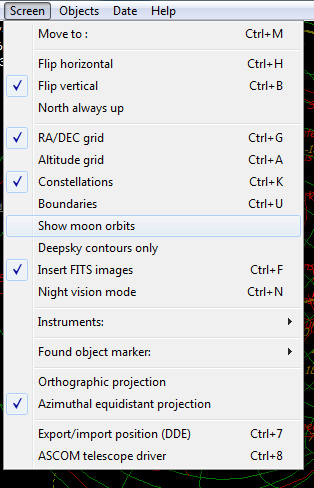 The Screen option provides you with options to adjust the screen options like Move to, Flip Horizontal, Flip Vertical, Always North Up, Grids, Constellations, Boundaries, Moon Orbits, and other similar stuff. 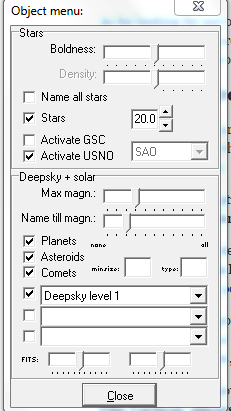 The Objects option is for adjusting the boldness, magnitude, and density of stars and deepsky objects. It will show you a dialog box in which you have to specify the criteria for adjusting the parameters. The Date option lets you choose the particular date and time for which you want to see and study the celestial bodies. 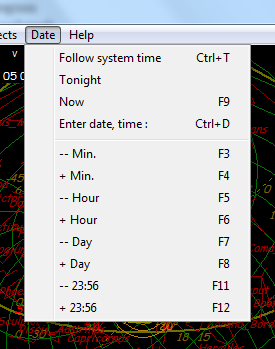 You can choose to Follow System Time, Now, Enter Date/Time, or any other particular time. This way, you can use all these tools and options and make changes to them. All the changes take place in real time and you can see the effect instantly. You may also like: 4 Free Planetarium Software to Explore Solar System on Your PC. 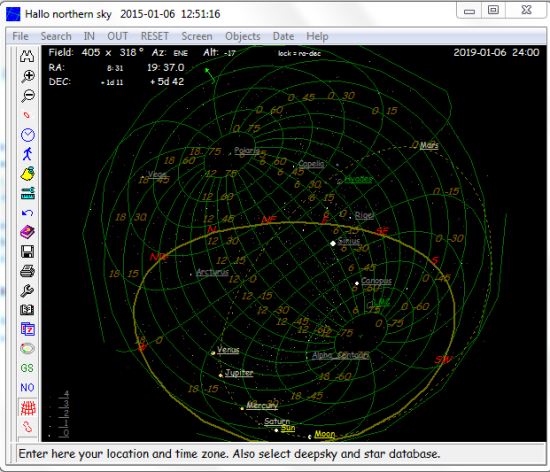 HNSKY is a good planetarium program for Windows to study and check different celestial bodies at different time or co-ordinates. 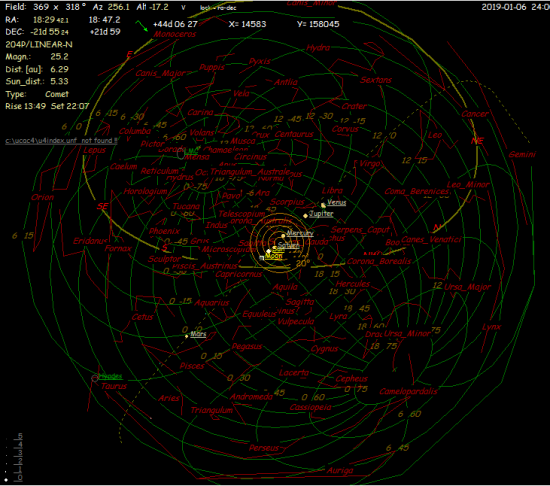 The freeware has a pretty large database and I was able to find all the celestial bodies I searched. Do give it a shot to check if it meets your needs completely.